I used to own a 2004 Subaru STI and can honestly say it was one of the most fun cars to drive on a daily basis for a reasonable price...so when someone sends in a nice looking example...I start to think I never should have sold it. Oh well. Many more cars before I've owned 'em all! 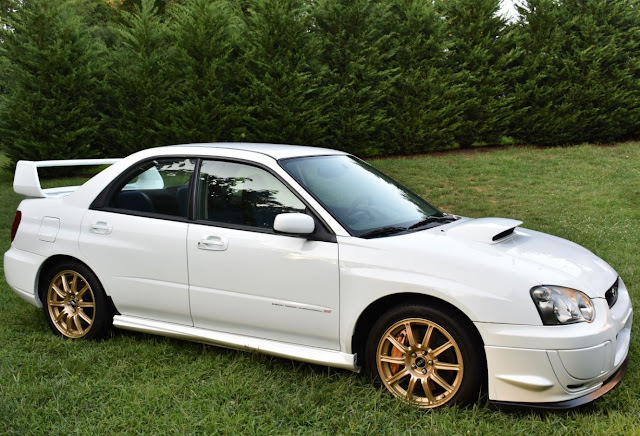 Find this 2004 Subaru Impreza WRX STI here on eBay bidding for $16,100 with 3 days to go, located in Lynchburg, VA. Undoubtedly one of my personal favorite body styles; a true icon of the STi, and becoming more difficult to find, with less than 2,800 gold wheel STi’s produced in 2004, and even less with this color combination. It has been very tastefully upgraded for performance, and more importantly done correctly by knowledgeable professionals. Recently purchased dream car….but reluctantly listing for sale due to meet some financial obligations. While I want top dollar, this can be had for a fraction of what book value is, not to mention the inflation on these cars, and the upgrades! $10K in receipts, but even more invested! Odometer reads 53,384, but this vehicle is flagged for a Mileage Discrepancy by CarFax, AutoCheck Does NOT (nor do others). Someone entered a flat mileage of "40,000" after the vehicle was past that. Please take this into account. This would concern me if the vehicle wasn't in great shape, but it performs exceptionally across the board. Interior in Excellent Condition (9/10), very clean considering the age, even the driver’s seat is amazingly clean and does not show any signs of wear. Exterior in great condition (8/10), has some paint chip specs, few dings in the body; overall better than expected for the age, but not perfect. 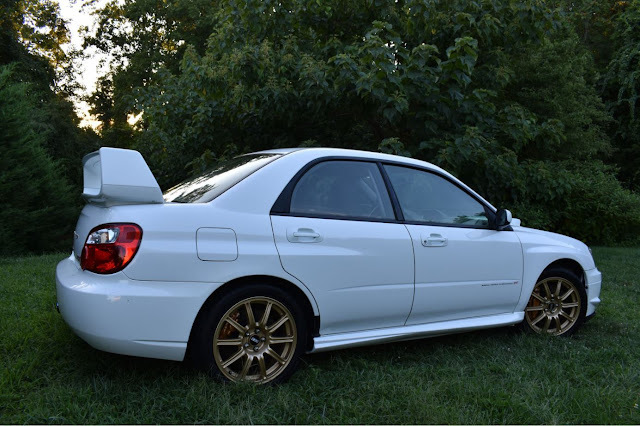 17” BBS Gold Wheels - One of the classic indicators of an STi, the original BBS wheels! Brembo Big Brakes - Huge Golden Brembo's for incredible braking! Two-tone Black & Blue STi Interior & Seats - Unique to the STi's, beautiful condition interior and embroidered STi seats. Sport-tuned Suspension, If you want a comfortable luxury quality ride, this is not for you. This suspension is made for handling and the driving enthusiast. (Easily in excess of $8,500 here in parts and labor) professionally installed and tuned by reputable Subaru & Turbo focused shops! Air Conditioner recently charged, blows ice cold. New Hankook Ventus V12 Evo2 Tires - Quality Tires! I can provide more photos / video / documentation, Please do not hesitate to ask! If you are from out of the area, I will definitely help coordinate with your courier and be here to help load the vehicle. Also Feel free to come inspect in person, but there will be no joy rides! I want the mileage exactly as listed out of respect to the listing!